Although many people live in homes where there is asbestos, they don’t necessarily develop health problems. If you are living around asbestos and not developing any health issues, then you may wonder why you should have the asbestos removed. The problem is that over time asbestos may deteriorate or become damaged so that it is released into the air. You can breathe it in once asbestos is released. 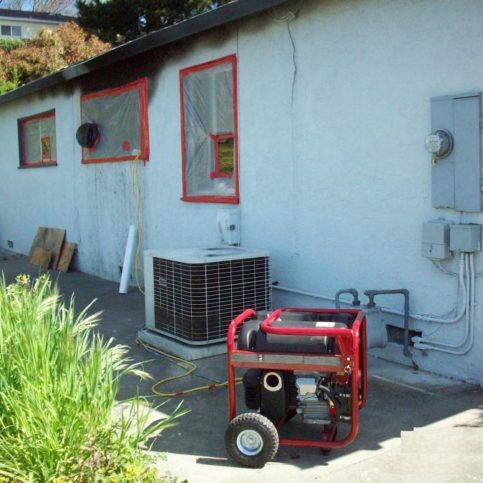 This is why you need a Contra Costa County asbestos removal company. Hazardous materials like asbestos can cause serious health problems. Just having asbestos in your home doesn’t necessarily mean that you are going to develop a health issue. Most of those who get mesothelioma or other asbestos related health problems were exposed to asbestos for a very long time. However, intact asbestos can break down and deteriorate. Once this happens and the asbestos has been disturbed, asbestos fibers can be found in the air and it may stay there for years. These fibers are invisible and you will not even realize you are breathing them into your lungs. A good Contra Costa County asbestos removal company can take care of your asbestos before it becomes a problem. They will handle every step from testing for asbestos to removing the asbestos. 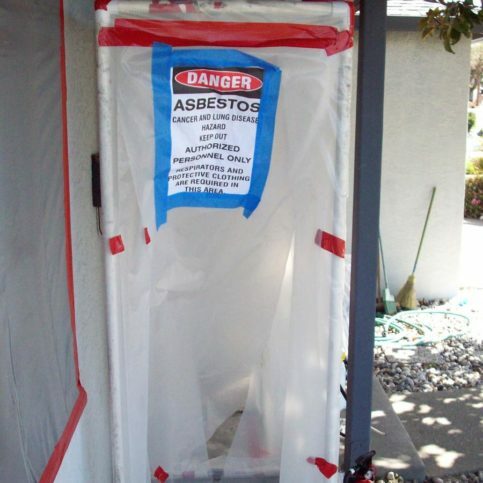 You have come to the right place when you hire a Contra Costa County asbestos removal company in the cities of San Ramon, Danville, Brentwood, Martinez and Pleasant Hill. Asbestos has been around for a long time. In the 19th century it was used in manufacturing as insulation and as a flame retardant. Asbestos can be found in tiles, insulation, paint, and cement as well as other items. If you are living in an older home, you could have asbestos. Most homes that have been built since the 1980is are free of asbestos. If you are concerned that you may have asbestos, you need to call a Contra Costa County asbestos removal company to come out and look at your house to test for asbestos. By the way, when you hire a Contra Costa County asbestos removal company in the cities of Concord, Richmond, Antioch, Walnut Creek and Pittsburg, you may want to take your family for a night out on the town because when samples are taken, the process itself will release some of the asbestos into the air. All Diamond Certified asbestos removal companies have been thoroughly researched for you. If you are unable to choose a Diamond Certified asbestos removal company in the cities of Concord, Richmond, Antioch, Walnut Creek and Pittsburg and the smaller areas of Discovery Bay, El Cerrito, El Sobrante and Hercules then you will have to do the research yourself. Obviously, not all asbestos removal companies are alike. They have different skills, various experience and differing personal philosophies about asbestos removal. It is your right to choose a qualified, trustworthy asbestos removal company in Contra Costa County that will do your asbestos removal correctly the first time. You will find a Diamond Certified asbestos removal company is just what you are looking for. They understand the serious health risks that are involved in asbestos being in your home and in the removal of asbestos. They will remove your asbestos and return your home to a healthy and safe environment. They are committed to giving you the best method of asbestos removal for your family’s protection. Not every asbestos removal company can give you the high quality results you want and good customer service that you need. This is why it is so important to do research if you are unable to hire a Diamond Certified asbestos removal company. Research is the key to finding and hiring the best asbestos removal company in Contra Costa County in the larger cities of San Ramon, Danville, Brentwood, Martinez and Pleasant Hill and the smaller areas of Briones, Byron, Canyon and Clayton. Most people who need asbestos removal have no idea where to start when it comes to hiring a good asbestos removal company. You want to be sure that the company you hire has the skill and experience to remove the asbestos from your home. When you make an informed decision, you not only save time and stress, you also save money. You need to talk with a few local asbestos removal companies after you have completed some initial research. When you are preparing to interview them, prepare a written list of questions so that you can keep notes of each company’s answers and comments. If the companies that you interview don’t meet your expectations or cannot answer your questions, it is your right to move on to the next company on your list. By doing research, you can make an informed decision on an asbestos removal company in Contra Costa County in the cities of Concord, Richmond, Antioch, Walnut Creek and Pittsburg. This will save you time as well as money. Once you have a plan in mind for your asbestos removal, you will probably be in a rush to get the asbestos removed by hiring a company. However, it is in your best interest to take the time to research local companies that will do the best job for you. The right asbestos removal company in Contra Costa County will make asbestos removal easy for you. A Contra Costa County Diamond Certified asbestos removal company will deliver the highest possible quality and result. The first thing an asbestos removal company will do asbestos test to see if you have any asbestos present in your home. Once a Contra Costa County asbestos removal company has determined that you do have asbestos they will begin to proceed with the plan for asbestos removal. Removing asbestos is a very dangerous job which is why it is important to hire a Diamond Certified asbestos removal company. If you are not hiring a Diamond Certified asbestos removal company, check with the Better Business Bureau to see if there have been any complaints made against the asbestos removal company you have found. Be sure the asbestos removal company has been in business for a few years. Get all estimates in writing as this will help you compare companies. Why Trust Diamond Certified Asbestos Removal Companies Rated Highest in Quality? Plastic barriers prevent the spread of harmful contaminants. It uses a patented method to dry, disinfect and decontaminate homes and buildings. P.W. Stephens also handles mold remediation. P.W. 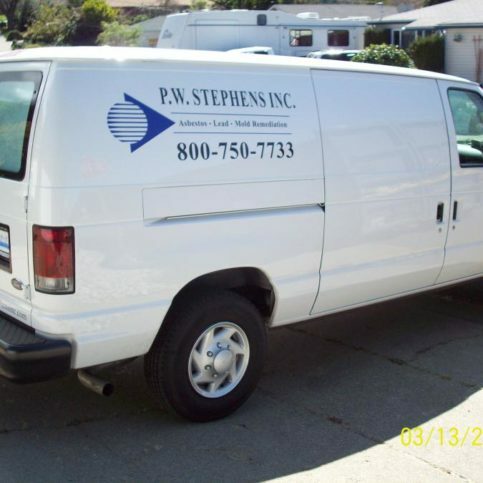 Stephens Environmental provides removal and remediation of hazardous materials. A P.W. Stephens Environmental technician removes asbestos from a client’s ceiling. In addition, it cleans and deodorizes HVAC duct systems. The firm serves residential, commercial and industrial customers. On-the-job safety is always a priority for P.W. Stephens Environmental. The firm takes every precaution to protect clients and their homes. After you have done some initial research, talk with a few local asbestos removal companies. Have a written list of questions and write down each contractor’s answers. Many asbestos removal companies will not provide estimates until they have first seen the job. However, you do not have to have every company give you an estimate. If they can’t answer your questions or they don’t meet your expectations, move on to the next company. Do I want a Diamond Certified asbestos remediation service that is rated best in quality and backed by the Diamond Certified Performance Guarantee? What is my timeline for the removal of the asbestos? How much can I budget for asbestos removal? What personal and professional characteristics would I like my Contra Costa County asbestos removal company to have such as good communication skills, timeliness, honesty, integrity, and reliability? Is removing asbestos going to have other consequences to my home that will require more work? Once you’ve narrowed down the field to a few of the best asbestos removal companies, visit some in person to meet their representative. Do you and your employees do all of the asbestos removal work or do you hire subcontractors? Will you provide a written contract for asbestos removal? How long do you estimate that the process of asbestos removal and clean-up will take? Will my family have to vacate the premises during the asbestos removal and if so, for how long? Do you expect that I will have to have any repeat treatments? Will my family have to vacate the premises while the asbestos removal is happening? How long should it take to do the asbestos removal? What type of warranty do you have for asbestos removal? Can I get a written contract? Do you do the diagnosis, removal and clean-up? Can you provide me with 10 of your most recent references? It is best to choose a Diamond Certified asbestos removal company because all certified companies have passed an in-depth ratings process that most other companies can’t pass. If you want quality from an asbestos removal company in Contra Costa County and the greater Bay Area, you can have confidence choosing a Diamond Certified company. If you can’t find a Diamond Certified asbestos removal company within reach, you’ll have to do some research on your own. It’s it’s wise to call some references provided by your asbestos removal company. Keep in mind, though, that references provided to you by the asbestos removal companies are not equal in value to the large random sample of customers surveyed during the Diamond Certified ratings process. Instead, contractors will likely give you a few customers to call that they know are satisfied. Were you satisfied with the service from this asbestos removal company? If you live in a smaller town such as Alamo, Bay Point, Bethel Island and Blackhawk, did you have to pay extra for their travel expenses to your home? Would you recommend this asbestos removal company to your friends and family? If you need this work done in the future, will you choose this same company? Your choice of an asbestos removal company is an important decision. So before deciding on the best asbestos removal company in Contra Costa County for you, it’s important to consider the following questions. Is this asbestos removal company’s estimate within my budget? Does the asbestos removal company offer a written warranty to back up their work? Is the company knowledgeable about the techniques they will be using for asbestos removal and the specific needs of my job? Can the asbestos removal company in Contra Costa County meet your needs when it comes to scheduling, customer service and experience? Asbestos removal does not have to be a major financial setback. Plan your budget and stick to it. After you have found a Contra Costa County asbestos removal company in Contra Costa County that you can trust, you will have peace of mind having your asbestos removed. When you meet with the contractor, use the notes that you have taken so you can accurately describe any concerns that you have. Be as detailed as possible and don’t be in a rush. It is as important for you to hear their suggestions and observations as it is for them to hear you. If you don’t understand something, ask for an explanation. You need to completely comprehend the plan and any problems or solutions. When you feel satisfied with the information you have received from your Contra Costa County asbestos removal company, sign the contract. Be sure that they have a phone number where you can be reached at all times. Expect the contractor to stay within the estimate. However, if the actual asbestos removal costs exceed the original amount of the estimate, the asbestos removal company must get your approval before moving ahead. Professional asbestos removal companies are able to handle the very small to very large aspects of their work. However, there are some things that you can do to prepare for them and to make their progress in removing your asbestos go more smoothly and more quickly. Doing these things may even cut down on their labor costs and can keep your home and belongings from being damaged. Remove any furniture or movable items from the area where they will be working. The more you do the more quickly they can get to work. Keep your pets and children away from the area. Your asbestos removal company will be focused on removing the asbestos and should not have to watch out for your pets or children at any time. 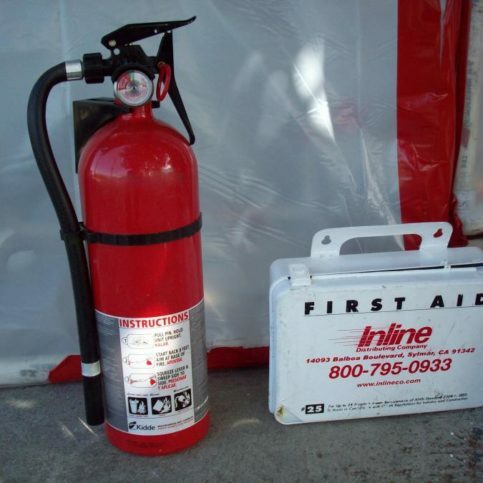 This not only prevents accidents and injury but also any expense that comes from accidents that may happen because of children and pets being in the way. Trim plants and bushes that are in the way of the asbestos removal area. You can save money and time by preparing the area for building by trimming or removing any plants, trees or bushes that are in the way. Ask your contractor what they recommend and the amount of space they require. Provide parking space and room for their work vehicles to maneuver. Some asbestos removal companies have large vehicles that require more space than average. Contact your contractor before they begin and ask them how many parking spaces they need and how much room they need for oversized vehicles. It is also helpful to walk through the area with your contractor so any hazards or clearance issues can be pointed out before the asbestos removal. It’s the asbestos removal company’s responsibility to remove your asbestos using the best possible techniques. But you play a big part in the success of your asbestos removal, too. Here are a few simple steps you can take to be a good customer when hiring a Contra Costa County asbestos removal company. Be clear and upfront with the asbestos removal company. Let them know what you want from your asbestos removal, the long-term outcome you’re expecting and specific ways they can satisfy your expectations. Be sure your service representative has a phone number where they can reach you at all times while they’re removing the asbestos. The work will move along more smoothly if your asbestos removal company can reach you for any necessary updates, questions or work authorizations. When your contractor contacts you, return calls promptly to keep the asbestos removal company on schedule. Pay for the asbestos remediation services promptly. Before you hire an asbestos removal company in Contra Costa County, restate your expectations and goals, and reiterate to the asbestos removal representative your understanding of the agreement. Most problems with local asbestos removal companies occur because of a breakdown in communication. By being clear about your expectations and theirs, you can avoid most conflicts. Ask your asbestos removal company if you should call to check on the progress or if he will call you with updates. Why would you want to be a good customer? 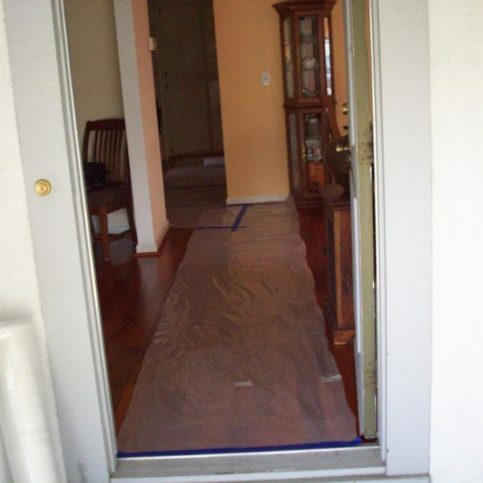 Asbestos removal companies in Contra Costa County appreciate customers who are straightforward, honest and easy to work with. Your good customer behavior sets the tone from your end and creates an environment conducive to a good relationship. Things may very well go smoother and any problems may be more easily resolved. When your asbestos removal is complete, you will be given a written invoice that details the completed work. The Contra Costa asbestos removal contractor’s name, physical address and license number. An itemized list of all supplies purchased. The total cost for supplies. The total amount due for labor. It is wise to compare the completed work with the written invoice. Ask your contractor to walk through the area with you and show you the work. Check the work with the invoice. During the walk-through, ask if there are any special instructions. If you have any questions about the work or materials used, now is the time to ask. The companyis name and physical address. Common asbestos removal services are listed below. Asbestos floor removal is the removal of any flooring that contains asbestos such as vinyl or the backing or glue of any flooring. Asbestos abatement is the removal of asbestos. Asbestos can also be contained so that it cannot cause harm. 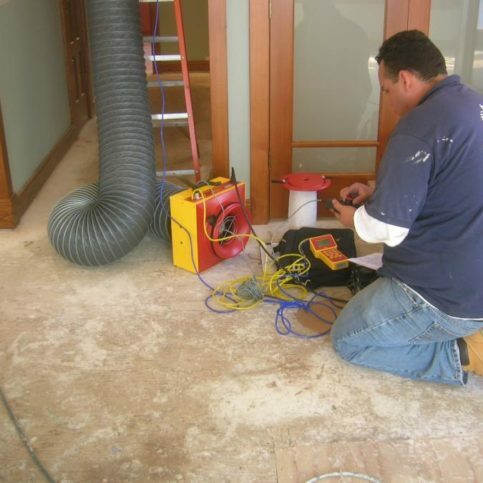 Asbestos tile removal is the process of removing tiles that may contain asbestos. The tiles may also be removed because the glue that is used to adhere them contains asbestos. Asbestos siding removal is the removal of siding that may contain asbestos. Many buildings have asbestos siding. Garage asbestos removal is the removal of garage materials that contain asbestos. Before the 1980is, garages may have been made of corrugated sheets made of asbestos cement. 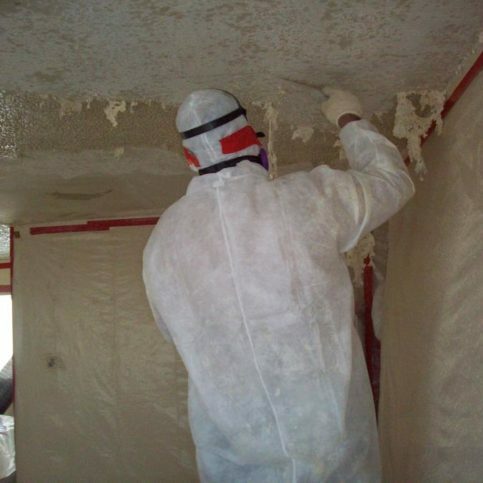 Popcorn ceiling asbestos removal is the removal of popcorn ceilings. 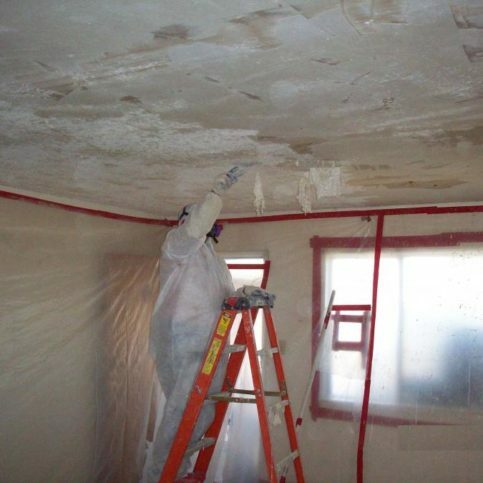 Popcorn ceilings can be made of paper and styrofoam so an asbestos removal company will need to test to determine the material. Asbestos roof removal is the removal of a roof that contains asbestos. After the roof is removed and properly disposed of, another roof covering will need to be done. 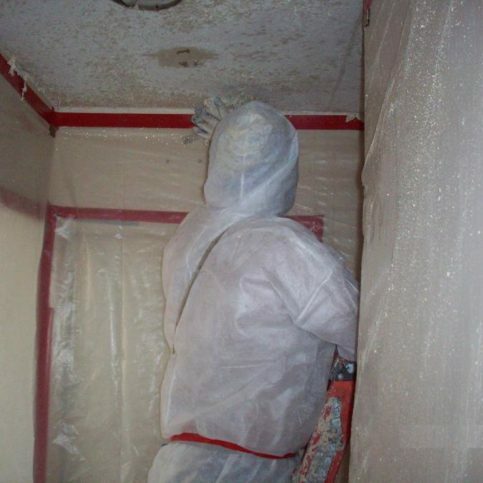 Asbestos dust removal is the removal of asbestos dust. 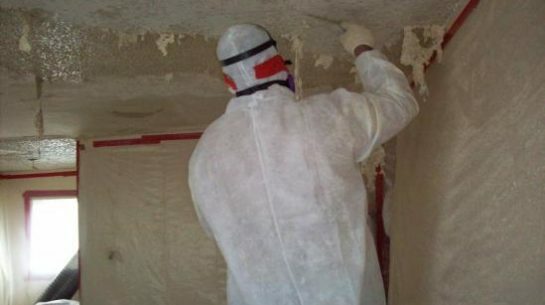 Asbestos insulation removal is the removal of insulation that contains asbestos. Asbestos cement removal is the removal of cement that contains asbestos. Activity-based sampling is the process of measuring airborne concentrations of asbestos when soil has been disturbed. Amosite is an asbestos that is in the group of amphibole. Asbestos is a mineral that naturally occurs and is composed of mineral silicate fibers from the amphibole and serpentine series. Asbestosis os a disease caused by inhaling asbestos fibers, however, it is non-cancerous but scars the lungs’ air-exchange regions. Asbestos cement is products made of cement and sand that have been reinforced with asbestos fibers. Asbestos-containing building materials are materials used for building that contain asbestos. Asbestos containing material is a material that contains asbestos. Asbestos vacuum cleaner is a vacuum cleaner used for removing asbestos. Carcinogen is a substance that causes cancer. Chrysolite is used commercial and is the common form of asbestos. Contaminant is a substance that can cause harmful health problems and is present in the environment. Continuous exposure is being exposed 24 hours a day for every day of the year. Dose is the amount of asbestos or other substance a person has been exposed to over a period of time. Exposure is being exposed to a substanced by swallowing, breathing or touching. Hazardous substance is any substance that is a public health or environmental threat. Media is any part of the environment such as soil, air, plants or animals that contain contaminating material. Mesothelioma is a disease of cancer of the lungs which is caused by asbestos. Mixed cellulose ester is a filter that is used for sampling air. Permissible exposure limit is the amount of exposure that is permitted or allowed. Personal protective equipment is covering such as clothing or equipment that is work to protect a worker against hazards or dangers. Pleural fibrosis is a disease of the lungs which can be caused from asbestos. Polarised light microscopy is a method that analyzes asbestos fibers. Polycarbonate is a type of filter that is used when the air is being sampled for asbestos. Presumed asbestos containing material is material that is assumed to have asbestos. Prismatic is crystals that are in the shape of a prism. Risk is the chance a person has of getting an illness or disease from exposure to asbestos. Stationary air monitor is a monitor that is used for sampling air. It is placed in one location and not moved during the sampling. Time weighting factor is the time that is considered for asbestos risk and means a lack of continuous exposure. Vermiculite, which is mined in Libby, Montana, is used for insulation and contains amphibole minerals. Q: Why choose a Diamond Certified asbestos removal company? A: Diamond Certified helps you choose an asbestos removal company with confidence by offering a list of top-rated local companies who have passed the country’s most in-depth rating process. Only asbestos removal companies rated Highest in Quality earn the prestigious Diamond Certified award. Most companies can’t pass the ratings. American Ratings Corporation also monitors every Diamond Certified company with ongoingresearch and ratings. And your purchase is backed by theDiamond Certified Performance Guarantee. So you’ll feel confident choosing a Diamond Certified asbestos removal company. Q: What are the health problems related to asbestos? A: Asbestos can cause cancer. This cancer is called mesothelioma and it affects the pleura, peritoneum or the pericardium. It also causes asbestosis which is a scarring of the lungs. Q: Where does one find asbestos? A: Asbestos is a naturally occurring substance and is found in the ground. It is actually being mined currently in other parts of the world including Russia and Canada. It was used for insulation products and other products that were fire resistant. Q: Who is at risk for developing health related problem to asbestos? A: Those that are at highest risk are those who work in industries that use asbestos on a regular basis. Shipbuilding and construction are 2 of those industries. Also, if you have mined asbestos, you are at higher risk. Q: How do I identify asbestos? A: You probably cannot identify asbestos just by looking at it. Asbestos fibers are long and rather like needles. Asbestos is often mixed with other materials which makes it more difficult to identify. The best way to know if your home has asbestos is to hire an asbestos removal company to survey your home. Asbestos is best dealt with by professionals. Q: Is asbestos considered dangerous? A: Asbestos can be dangerous especially if there is long term exposure, if it has been damaged or if it is deteriorating. Old asbestos can break apart and become airborne. When asbestos fibers are airborne, they can be inhaled and cause damage to the lungs and other areas of the body. Asbestos can cause a type of cancer called mesothelioma as well as other lung scarring and problems. Q: How does a physician diagnose if I have been exposed to asbestos? A: There is no test to determine if you have been exposed to asbestos. The most common way to check for exposure is to look for disease by having a chest x-ray. A physician may also give you a pulmonary function test which determines your lung capacity. If there has been a decrease in lung capacity or the x-rays show early signs of lung disease, then they may determine that you have had exposure to asbestos.If you know that you have been exposed, you may want to have regular physical examinations by a physician. The risk of developing disease is related to the frequency and length of your exposure to asbestos. Smoking cigarettes can also increase your risk of developing asbestos related diseases. Q: If I know that I have asbestos in my house, is it absolutely necessary for me to have it removed? A: You need to have an asbestos removal company do a test to check for asbestos. Most of the time it does not need to be removed but only an asbestos removal company can tell you that. Often the asbestos is in tile, siding or roofing. These materials don’t usually break down so an asbestos removal company will, more than likely, determine that this doesn’t need to be removed. However, if asbestos is found in an area that may be disturbed, you will want to schedule asbestos removal. Q: Which type of asbestos is the most dangerous? A: Crocidolite has caused more cases of mesothelioma than other types of asbestos. Most asbestos comes from the type Amphiboles. It seems that Chrysolite, which is different than Amphiboles, has fewer risks and less disease associated with it. However, any kind of asbestos carries risks associated with it.